The database does not indicate the counties that are included in the database. The suggested record citation also does not indicate the county from which the entry was taken. The “record” also does not include any event place more specific than the state of Iowa. While that’s better than nothing it is not very specific. The citation simply indicates that the entries in this database were taken from county records–without naming those counties specifically. The entry for Ada Neill is image number 02532 in digital folder number 004171528. 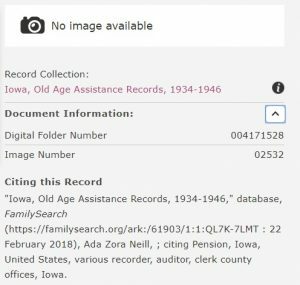 The card catalog search indicated that this record was from the “Old Age Assistance” records in Adams County, Iowa. The card catalog images are on FamilySearch, but with limited access (either LDS Church members, at a family history center, or at a FamilySearch affiliate library. I’ll have to make a list of counties relevant to my research that in the database. I’ll also have to make a list of those individuals whose actual record images I would like to see. But I still wish that the citation that’s autocreated for this record included the county. That would save me the time of looking up counties for individuals when the county ends up being on the other side of the state from where my people live. I’m happy about having access to the index. There are quite a few relatives that I have located in the database.